Two women have traveled across the country to join Beyond Extreme Energy’s 18-day fast at the Federal Energy Regulatory Commission (FERC). Their communities have been directly harmed by the permits FERC has issued or has pending regarding fracked gas infrastructure. 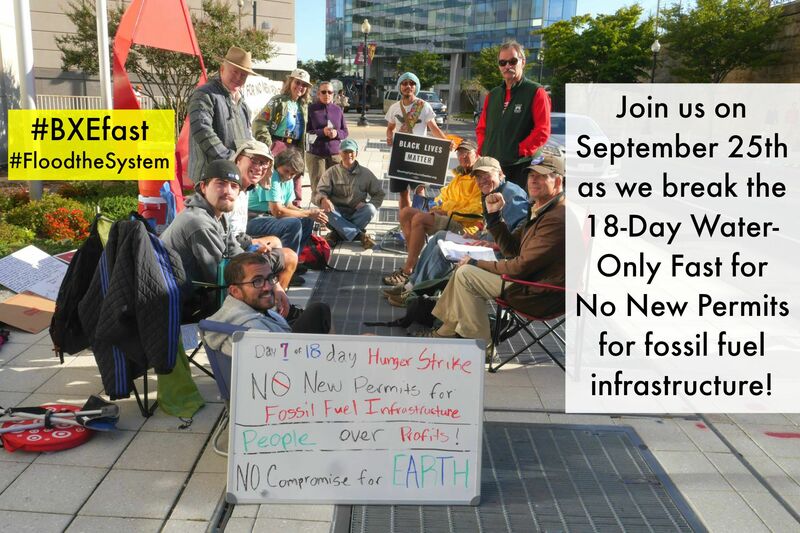 A dozen members of BXE began their fast September 8 calling on FERC to stop issuing new permits. This is in line with Pope Francis’s call in his recent encyclical for the world’s leaders to immediately address the already devastating impacts of climate change – fueled by the burning of fossil fuels – especially on the poor who have contributed the least to the problem. Pramilla Malick is the mother of four and a resident of Minisink, New York, where the Millennium Pipeline, owned by parent company NiSource, built a compressor station. She says that FERC approved it over the concerns of residents about methane and other toxic emissions, and the risk of catastrophic explosion. One of the long-term fasters, Jimmy Betts of Omaha, Nebraska will also speak. BXE will end the fast at noon on Friday, September 25, with a ceremony that will include music, brief statements, and a procession to honor the Planet and the People featuring BXE’s colorful and moving 50-foot anti-fracking banner, “The United States of Fracking,” around the FERC headquarters block. Five clergy members representing different faiths will present copies of the Pope’s encyclical to the five FERC commissioners.